It's time for another challenge over at Papertake Weekly. This week we have an excellent sketch for you to follow and to help us we are sponsored by Simon Says Stamps. I've made this card using one of my favourite stamps which I have had for an age. It's the perfect image for a female when cute isn't quite right. The company is Stamps Happen Inc and it's called Paris Socialite. If you would like to buy this stamp, pop over to Simon Says Stamp. I really like the papers used but unfortunately I can't tell you anything about them as I received then as a Christmas present and there isn't any company name on them. I used Copics (B000, B00, B02, RV10, E000, E00,E02, C7, C5) to colour the image and Tim Holtz Distress Inks around the edge. To add sparkle to her clothing I've used liquid pearl and stickles glue. To embellish the card I have stitched around the edge of the papers and added a couple of clear gems. That's about it today, but be sure to check out my fellow DT mates for lots more inspiration. I love your card especially that stamp. I've never seen it before but I love it, might even buy it. 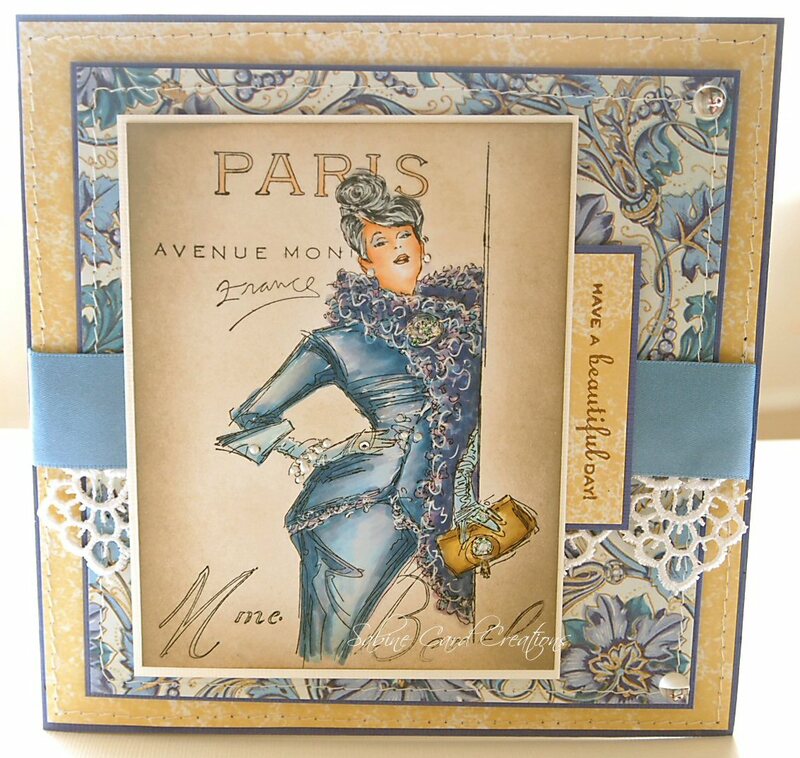 Gorgeous card and I love that image you used. Goes so well with the DP here and the lace trim. So elegant! Oh what a gorgeous, fabulous card jenny.